We heard of your beloved sisters death through Mr Badham soon after it happened and you can readily imagine the surprise and sorrow felt on hearing such unexpected and melancholy intelligence. We can indeed sympathize deeply with you and our only consolation is, that she has left this world for a better home. Godma has her picture. I am exceedingly anxious to see your little niece, I know if you think her pretty, she is perfection personified. This old city is quite dull and monotonous now, although it has been very gay. You expressed some desire in a previous letter to hear something of the Twelfth night party It succeeded very well. Your flame, Miss Anna Blair drew the ring and Mr Gatewood of Norfolk was king. They sustained their characters admirably. It was, as usual, considered a very pleasant party. It, being rather of a novel character induced some of the young men, to poetize on the occasion. I regret exceedingly that I cannot obtain a copy of the verses for you. They were very complimentary to the ladies, but quite the reverse on the gents. To give you some idea of it I write as much as I can recollect. one stanza thus. How sweet she did play and – how she did sing. Eliza’s silk stocking c.1840-1848 is marked “Eliza Fisk H” in India ink at the top, and is darned at both the heel and toe. Courtesy Susan Inglis. 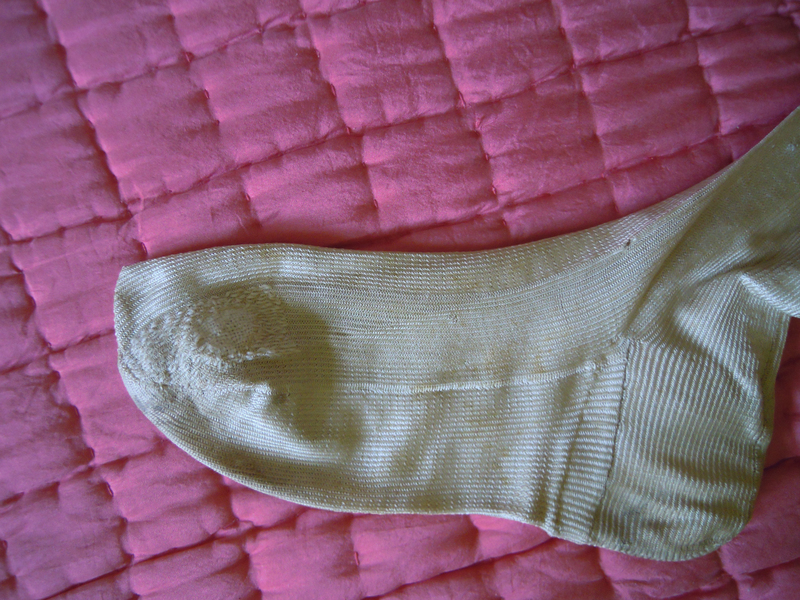 I, of course, was a great belle, you may judge so as a new pair of satin shoes, hose and even feet had holes, occasioned by dancing. Mrs Henly gave a party soon after, and another tribe, thought to try their poetical talents. I have heard that Mrs H was much offended at it. The Fair took place on the twenty fifth of February, was held in the Court-House. Godma had the Post Office, with seemly table, two cakes, a ring in each. The amount cleared far exceeded the expectations of every one, I believe it was six hundred and ten dollars. About that time, there was such a mania for scribbling poetry, that this indeed occasioned a theme for some unknown son, whoever it be, takes care to keep dark; as much has been said and many thanks made I presume the mania will or has subsided. He wrote an apology, which was even worse than the lines. Miss Julia Thompson has been with us, for nearly three months she speaks of leaving, sometime next week. Mr Bright is all devotions I believe she discarded him last summer. Judge Christian is the most sickening of all lovers; it is said that Miss Burwell has entraped him. Miss Hariet Thompkins is in town and I don’t know how he gets along. 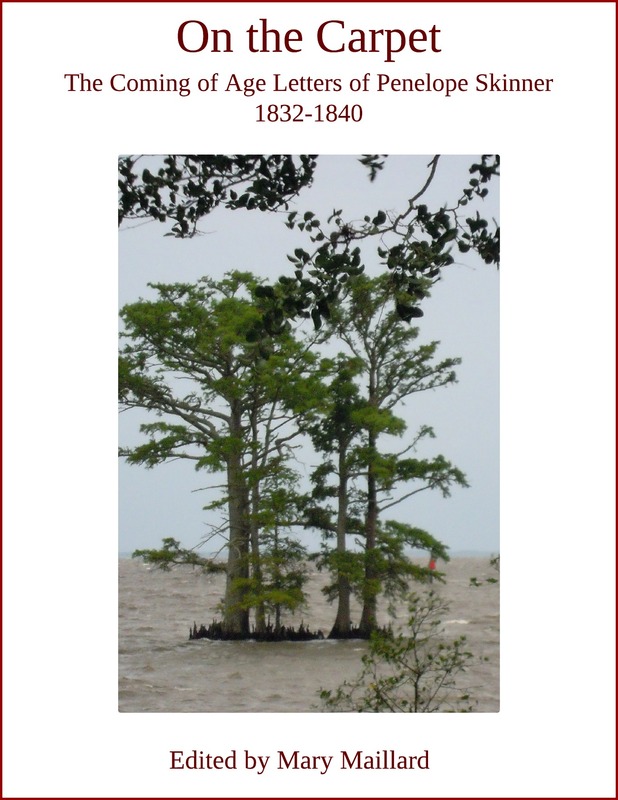 Misses Tyler and Carter remain in status co: not belles, but with Trim Browne and Fred Murdaugh. The Misses Perkins are in town staying with Miss Mary Carter, I cannot say much for their beauty. Mrs Randolph who has been absent for several months returned last Wednesday with her niece. I saw the old lady at church this morning decked off in a black silk albeit short cloak, trimmed round with broad, blonde lace and a white silk bonnet with broad lace around that. she is in the time of the fashion as cousin Dickie says. Mrs Tazewell and her daughter Sally arrived a few days since. I don’t think the latter as pretty as her sisters. 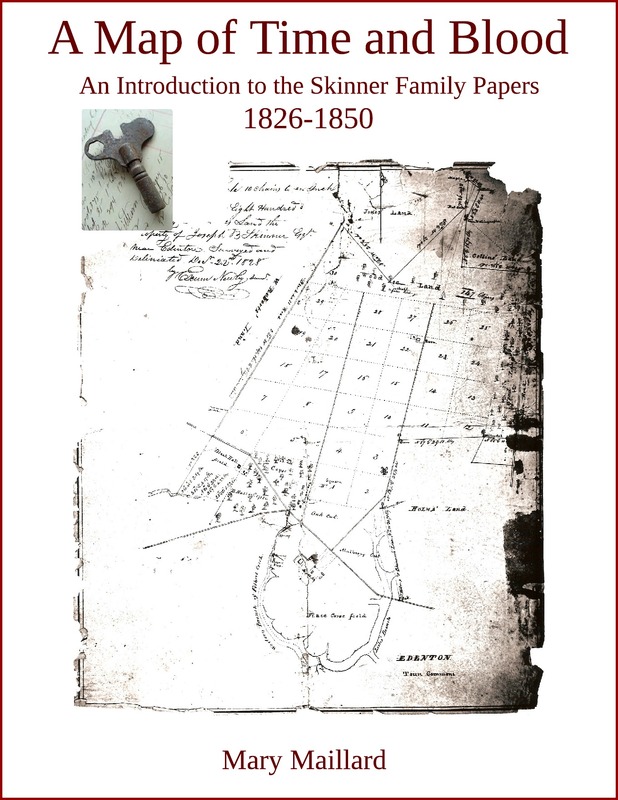 It is true that Miss Henrietta is married to Mr Fox, and it has been reported that Miss Louisa was to marry Mr Lyle that was here last session. To hear her mother speak you – would think Henry had married some great character. Mr Drinkard still visits Miss Cate Travis. Report says he is to marry Miss Mary Martin but this is a mere blind. Cousin Dickie says the report this evening is, that General Harrison is certainly dead. I expect when the Governor takes the “Presidential chair” that John and Robert will almost stand on their heads. Our household now consists of Mssrs Wilsons, Fox, Old and Parker. 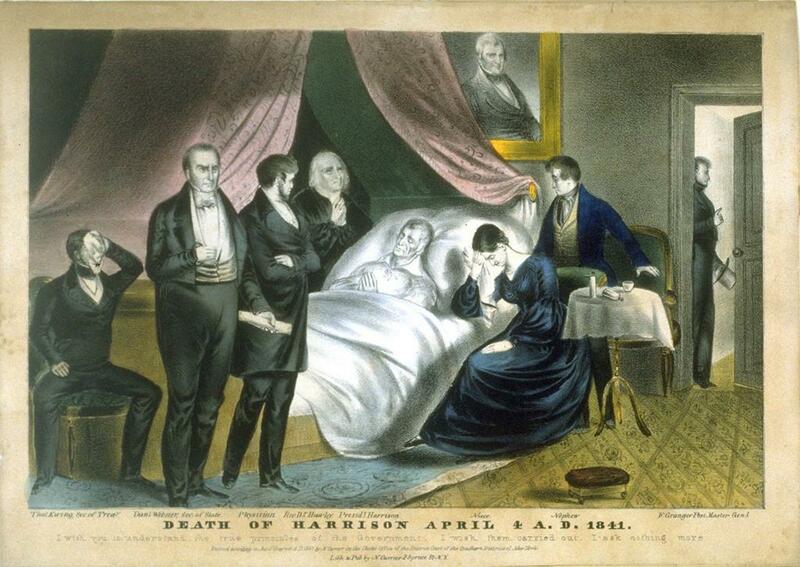 Death of Harrison April 4, 1841, lithograph by N. Currier. Library of Congress ID cph.3a06021. 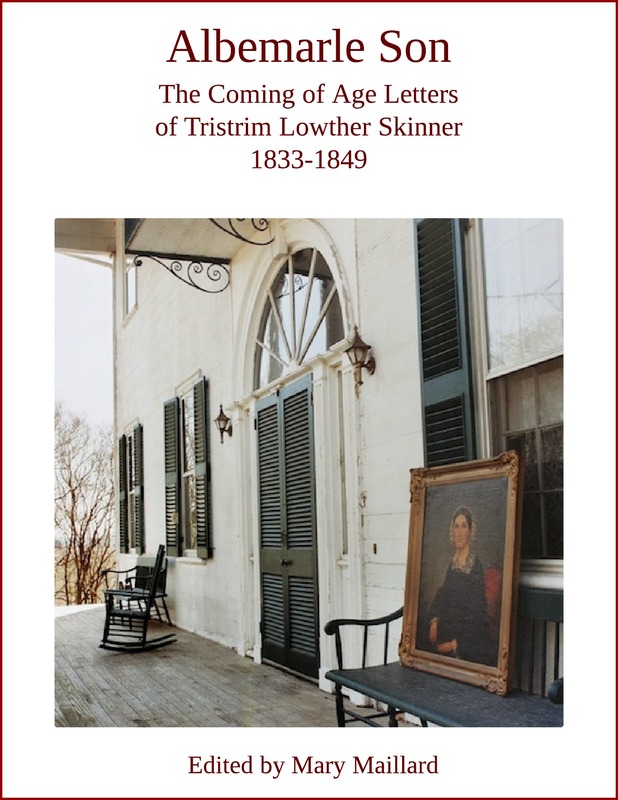 Monday Morning: An express was sent for Governor Tyler this morning and he and his private secretary, his son John have gone to the white house. I know your curiosity is now at the higher pitch from what I have said relative to the poetry. I will gratify it by copying the verses written on The Fair. 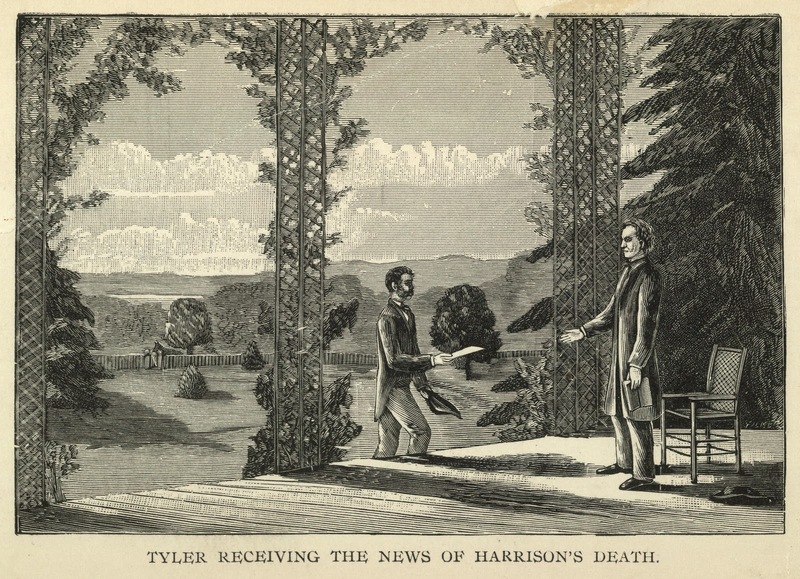 Governor John Tyler receiving the news of Harrison’s death. 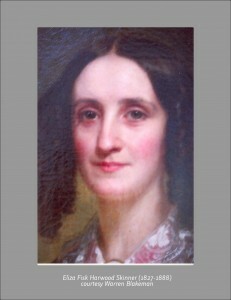 Tyler was Eliza Harwood’s nearest neighbour in the southern section of Williamsburg. Illustrated in Stoddard, William Osborn, 1835-1925. The Lives of the Presidents, v. 5, New York: Frederick A. Stokes & Brother, 1888, between pp. 12-13. 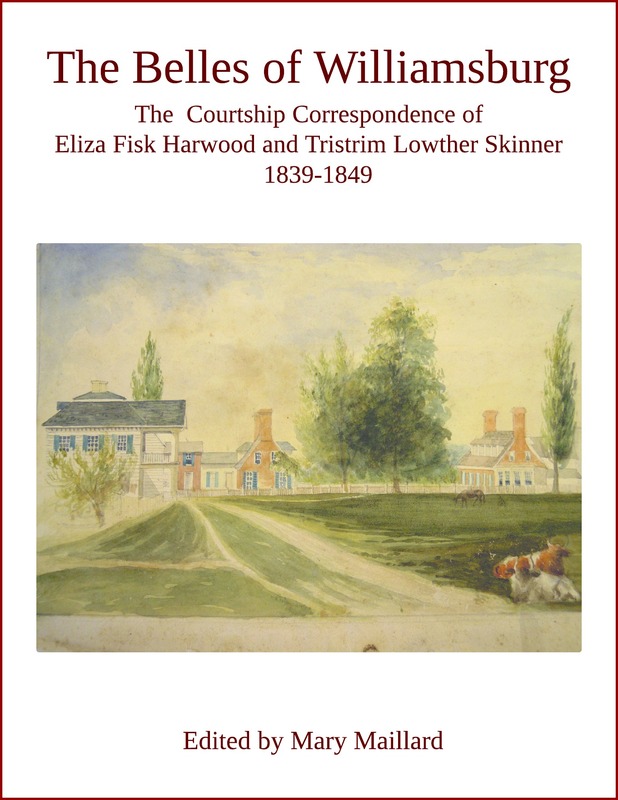 Excerpt from Mary Maillard, ed., The Belles of Williamsburg: The Courtship Correspondence of Eliza Fisk Harwood and Tristrim Lowther Skinner 1839-1849 (January 2015).